This is a first-rate crime thriller that commands attention from the opening pages and keeps the reader gripped until the end. The writing is tight and the story is well plotted. The tale unfolds at a good pace with McKinty ably balancing the steady unfolding of the investigation, including some interesting forensic detail, with episodes of exciting action and a suspenseful trip to Finland. McKinty's wry sense of humour is also well on display and he peppers his story with small details that enhance his depiction of the period, but which will also darkly amuse readers...A funny & very engaging tale that sets an early high standard for this year's crime fiction. Highly recommended. Adrian McKinty's thoroughly engaging crime novels are set in the Northern Ireland of the 1980s. Rain Dogs is another superb addition to the series with McKinty having the brilliant idea of challenging his detective with a locked room mystery [a trope] straight out of the golden age of 1930s detective fiction. 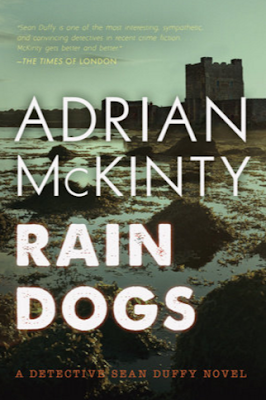 McKinty has all the virtues: smart dialogue, sharp plotting, great sense of place, well-rounded characters and a nice line in what might be called cynical lyricism (“Rain. Wind. The afternoon withering like a piece of fruit in an Ulster pantry.”) If Duffy’s relentless patter occasionally makes you feel like you’re trapped in a lift with a stand-up comedian, well, those dreary steeples cry out for a little antic distraction. Be warned, though. 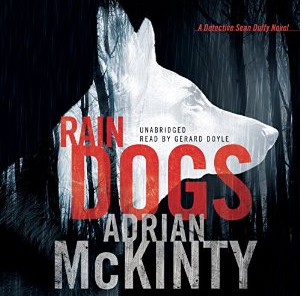 Rain Dogs is Gateway McKinty: you won’t stop here. Australian crime writer Adrian McKinty is on a roll. His last novel in the Sean Duffy series set during the troubles in Northern Ireland, Gun Street Girl, has been shortlisted for an Edgar award by the Mystery Writers of America. The latest, Rain Dogs, does not disappoint. The dark humour, the verbal jests, and the seamless insertion of real historical figures and events into the fictional narrative are all superbly sustained..There is so much to enjoy in this book: Duffy's musical asides (the snide remarks about U2), the great banter between Duffy and his colleagues, and the walk-on role of Duffy's buxom neighbour, Mrs Campbell, and her cakes. And the conclusion takes Duffy and the reader somewhere completely unexpected. This is clever historical fiction with the bite of social commentary and the joy of a crime series at its zenith. Det. Insp. Sean Duffy must solve the equivalent of a locked-room mystery in McKinty’s scorching fifth installment in his excellent Troubles-set Northern Irish crime series (after 2015’s Edgar Award Shortlisted Gun Street Girl)....McKinty expertly balances Duffy’s tense and suspenseful investigation with the political tensions of the region. The chronicles of Carrickfergus detective Sean Duffy open a sardonic portal to 1980s Belfast; every detail rings true, from the persistent threat of mercury-tilt car bombs to the complex criminal motivations that breed in a climate of unrest...McKinty manages a second locked-room success and folds in the recent headline-snatching Jimmy Savile scandal to boot; another great standout in a superior series, combining terrific plotting with evocative historical detail.